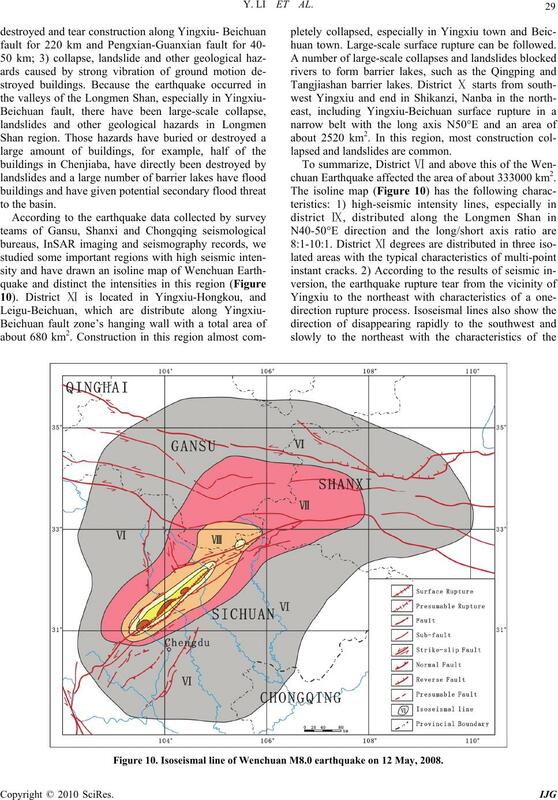 to depth rate as well as the occurrence of large shallow Wenchuan earthquake. opportunity to advance the subject of seismic sciences. gan in the 1990s [1-15]. thrust dips to the west and does not have a mountain root. China grant 40841010 and CGS grant 1212010918010. 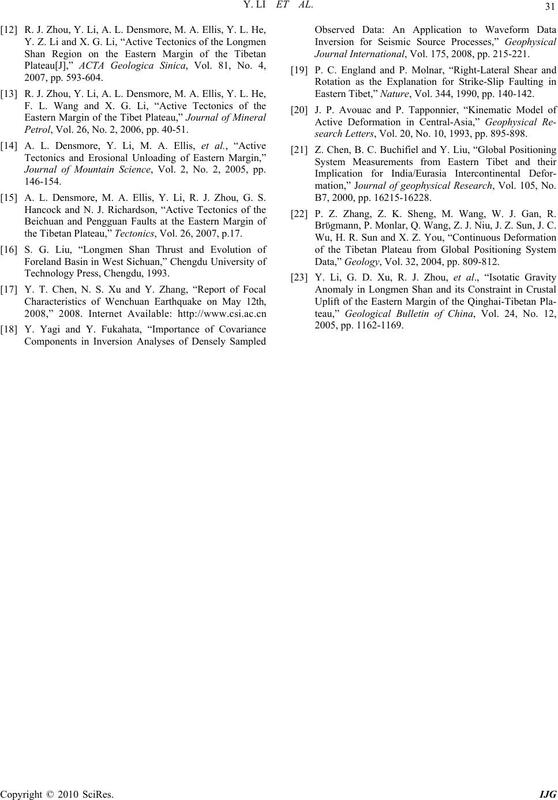 22 Y. LI ET AL. 0.3-0.4 mm/a in Jiuding Shan [1,16]. thrust belt and foreland basin [1-15]. have published basic parameters and focal mechanisms. sources and methods. The USGS recorded that the Mw. ing 229° and fracture plane dipping 33° with strike-slip. property loss was much bigger than other directions. image is apparent, cutting a wide range of terrain units. uan fault and Pengxian-Guanxian fault. Figure 1. 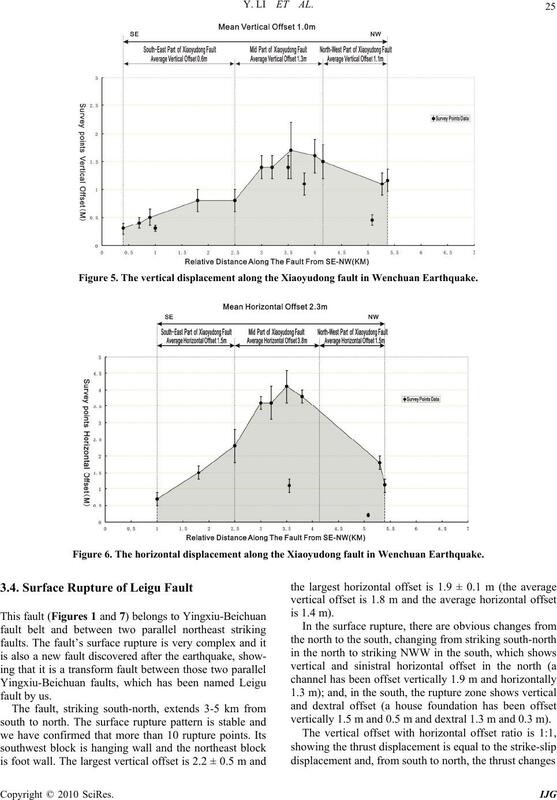 Distribution of surface rupture of Wenchuan Earthquake in Longmen Shan. being equal to the dextral strike-slip movement. Figure 2. 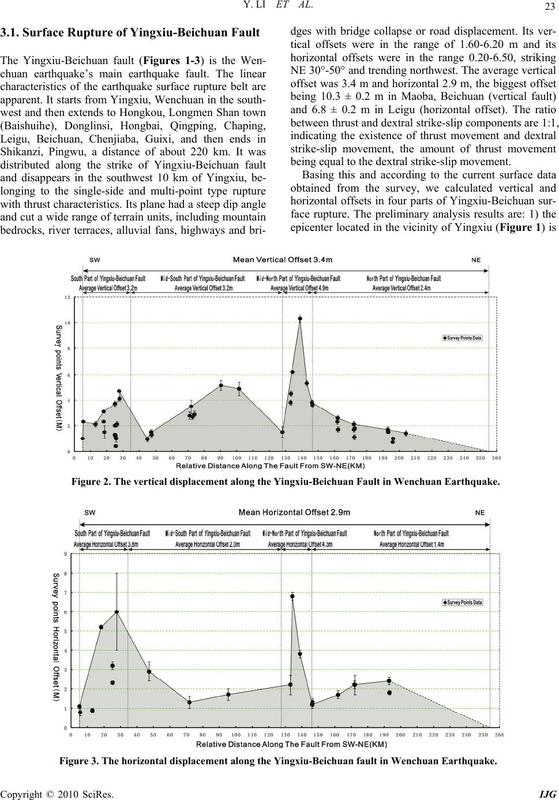 The vertical displacement along the Yingxiu-Beichuan Fault in Wenchuan Earthquake. Figure 3. The horizontal displacement along the Yingxiu-Beichuan fault in Wenchuan Earthquake. divided into two high-value and two low-value zones. strong earthquake in the future. ized by dextral strike-slips shortening with steep dipping. placement, showing thrust and shortening characteristics. Figure 4. 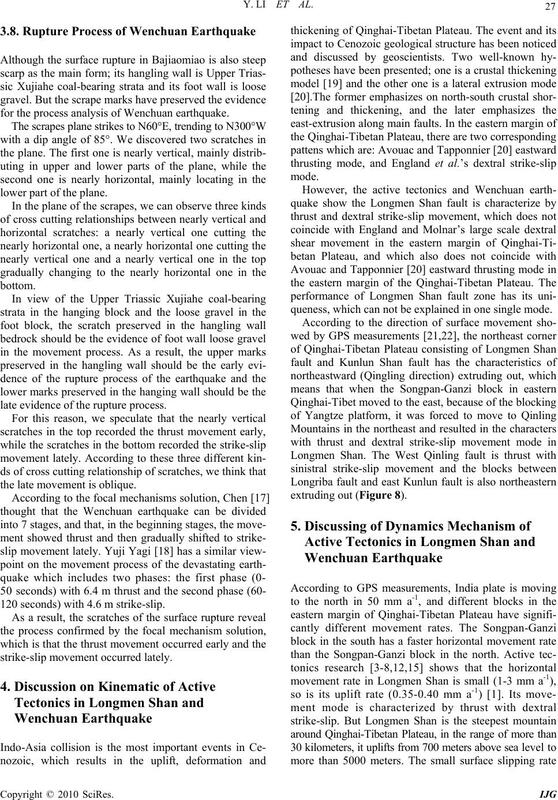 The vertical displacement along the Pengxian-Guanxian fault in Wenchuan Earthquake. Figure 5. 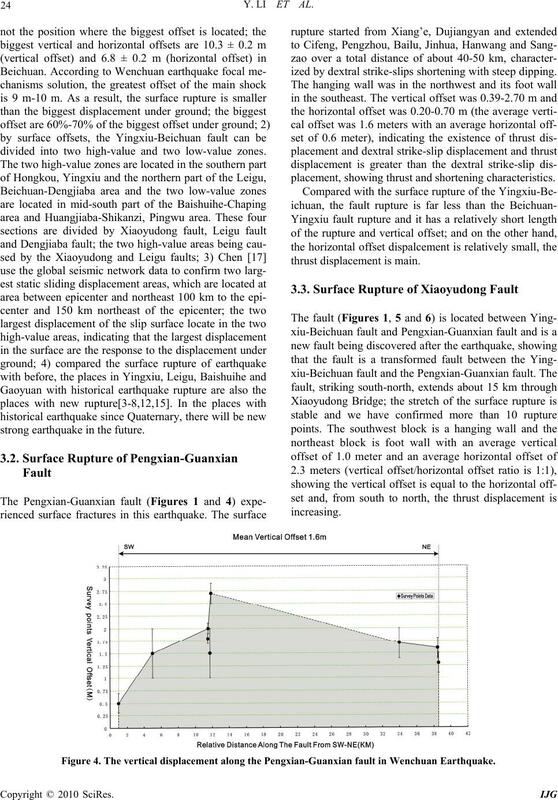 The vertical displacement along the Xiaoyudong fault in Wenchuan Earthquake. Figure 6. The horizontal displacement along the Xiaoyudong fault in Wenchuan Earthquake. vertically 1.5 m and 0.5 m and dextral 1.3 m and 0.3 m). Figure 7. 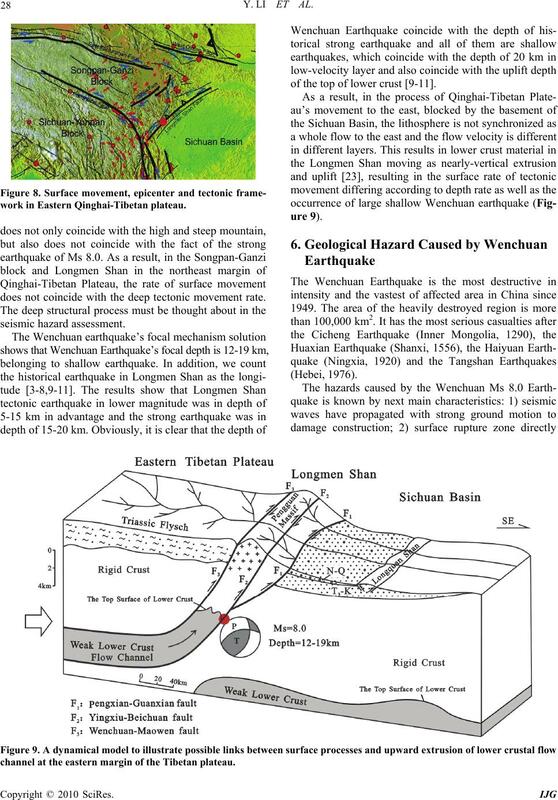 The vertical displacement along the Leigu fault in Wenchuan Earthquake. road scarps are easy to identify. the vicinity of the fault. tending fault in high-angle should be representative. on reveals that the dip angle of plane is only 33°-39° . similar to an imbricate thrust fault’s structural features. ening rate of the pressure ridge is 28.6 percent. clear structural shortening rate in Wenchuan Earthquake. 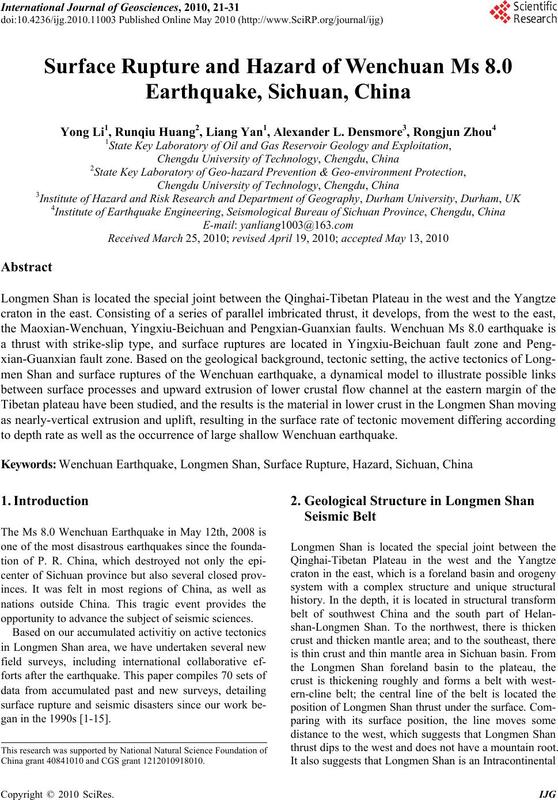 for the process analysis of Wenchuan earthquake. lower part of the plane. late evidence of the rupture process. the late movement is oblique. 120 seconds) with 4.6 m strike-slip. queness, which can not be explained in one single mode. of the top of lower crust [9-11]. work in Eastern Qinghai-Tibetan plateau. does not coincide with the deep tectonic movement rate. channel at the eastern margin of the Tibetan plateau. huan town. Large-scale surface rupture can be followed. lapsed and landslides are common. chuan Earthquake affected the area of about 333000 km2. Figure 10. Isoseismal line of Wenchuan M8.0 earthquake on 12 May, 2008.
construction in the affected areas. 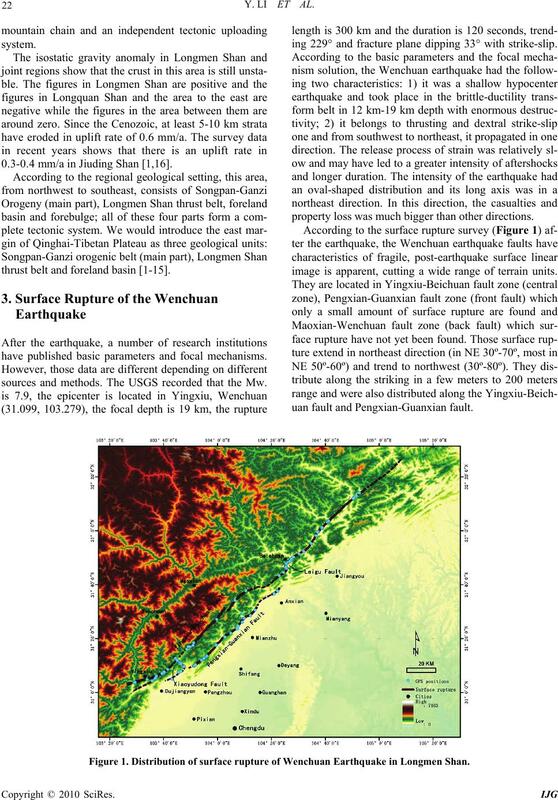 sinian Orogeny,” Basin Research, Vol. 15, 2003, pp. Geological Publishing House, Beijing, 2006. Vol. 26, No. 4, 2006, pp. 26-34.
ment,” Quaternary Research, Vol. 26, No. 1, 2006, pp. mentary Journal, Vol. 24, No. 2, 2006, pp. 1-12.
science), Vol. 35, No. 4, 2008, pp. 404-413. No. 12, 2008, pp. 1688-1706. Petrol, Vol. 26, No. 2, 2006, pp. 40-51. Journal of Mountain Science, Vol. 2, No. 2, 2005, pp. 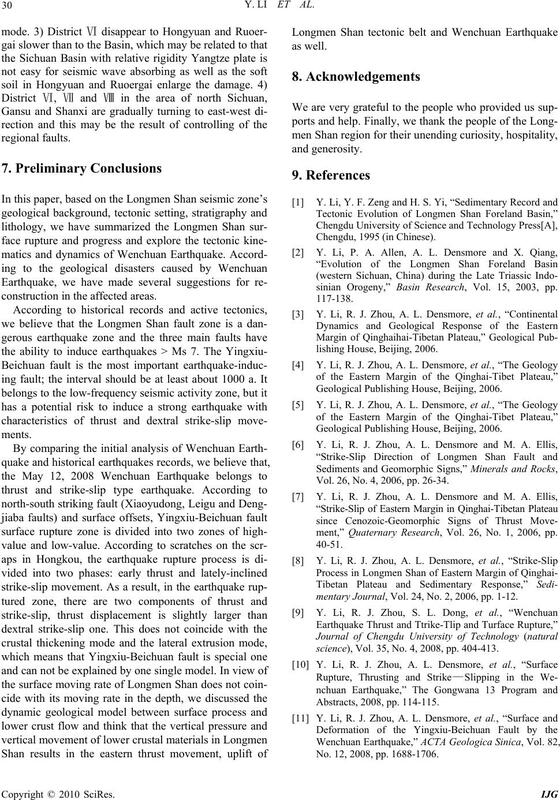 A. L. Densmore, M. A. Ellis, Y. Li, R. J. Zhou, G. S.
the Tibetan Plateau,” Tectonics, Vol. 26, 2007, p.17. Journal International, Vol. 175, 2008, pp. 215-221. Eastern Tibet,” Nature, Vol. 344, 1990, pp. 140-142.
search Letters, Vol. 20, No. 10, 1993, pp. 895-898.
mation,” Journal of geophysical Research, Vol. 105, No. P. Z. Zhang, Z. K. Sheng, M. Wang, W. J. Gan, R.
Brϋgmann, P. Monlar, Q. Wang, Z. J. Niu, J. Z. 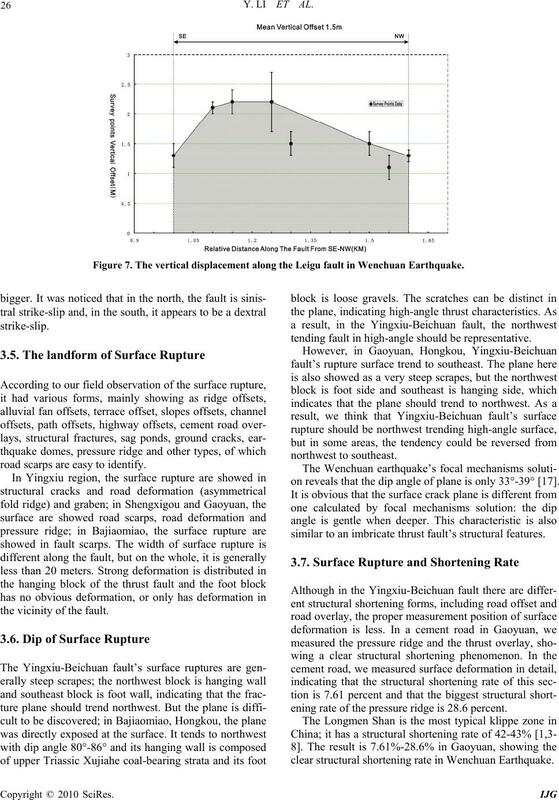 Sun, J. C.
Data,” Geology, Vol. 32, 2004, pp. 809-812.